It's Christmas Eve and you have a surprise visitor. Unfortunately, he is not dropping off presents. No, he is taking them! Somebody will be opening your presents and that somebody won't be you if you do not protect your home from the Christmas burglar! Luckily, The Fuzion 4 team have an early Christmas gift for you. 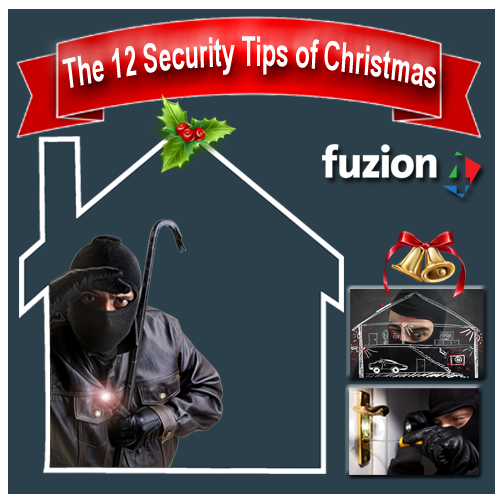 Here are the 12 security tips of Christmas. Keep Gifts Out Of Sight - Don't keep Christmas presents in places where they can easily be seen from outside your home. Ensure Your Home Looks Occupied At All Times - You can do this by leaving a radio or light on. Ensure All Doors And Windows Are Securely Shut And Locked - REMEMBER outside festive lights with their wires running through a door or window can make it difficult to make your home completely secure! Unattended Parcels - If you have done or are doing your ‪xmas shopping online this year. Make sure someone is home to receive the deliveries and don't give permission for them to be left on the door step. Dispose Of All Packaging - Never leave packaging outside your home; you will just be advertising to a burglar what fancy, new items you have gained over the festive period. Never Keep The Receipts With The Presents – Never throw unwanted receipts in the normal rubbish shred them instead. Have Someone Keep An Eye On Your Home - If you’re going away for longer than a day, ask a neighbour or relative to keep an eye on your property. This could just be by taking the post in and opening and shutting the curtains for you. By doing this, it can help prevent any unwanted attention from prying eyes. Cancel Deliveries - If you are going away avoid making it obvious by cancelling milk and paper deliveries. These can easily stack up outside; making it clear no one is home. Black Out - Switch off Christmas lights and other electrics when you're not home, to eliminate the possibility of fire. Blow Candles Out - Never leave candles unattended in the home and make sure they're not positioned on flammable surfaces. Social Media Advertising - Avoid sharing too much information about your Christmas and holiday plans on social media. If you decide to post pictures be careful, ‪‎burglars could be using these sites to identify potential targets. Consider ‪Home Security - If you don't already have one, consider having an ‪intruder alarm installed. Burglars tend to go for the easy option, so an unprotected home will stand out against those visibly alarmed. Our final tip is to enjoy yourself and have a happy Christmas from all the team here at Fuzion 4! Set up is actually remarkably easy. The process entails walls mounting the user interface as well as closing entry ways like windows and doors by effortlessly putting wireless motion sensors and detectors but don't forget to put aside all of your custom wholesale glassware throughout the installation procedure www.best-5-home-security-companies.com.